As if stunning ships and spectacular destinations aren't enough, we've made big reductions on a range of Celebrity Cruise Holidays in Europe, the Mediterranean, Arabian Gulf and Indian Ocean. Plus, we're giving FREE Drinks for the first two guests (worth over £750) and FREE soft drinks for additional guests in the same stateroom (worth over £225pp) when you book an Oceanview stateroom or above! Luxury comes as standard with Celebrity Cruise line and your stateroom is no exception to that promise. Your cabin is your own private haven away from the rest of the world and it’s tastefully appointed with clean, contemporary lines and warm and inviting decor. The Celebrity staterooms have been designed to feel like an exclusive boutique hotel and as a result they feature a 24 hour room steward, 100% Egyptian cotton sheets and those choosing Concierge Class or above even get to choose their pillow preference for a perfect night’s sleep. You’re in for more than just a treat or two on a Celebrity Cruise. It’s a paradise for foodies with 12 award-winning speciality restaurants across their fleet. Offering truly spectacular culinary experiences, Celebrity Cruises create an array of dishes from contemporary sushi to traditional French cuisine. Whether you’re enjoying tender steamed mussels in The Porch overlooking the green grass of The Lawn Club or sampling whimsical wonders like lollipop sushi from the innovative Qsine dining spot, there’s a variety of options onboard to tantalise your tastebuds. Celebrity Cruises compliment their culinary masterpieces with the largest wine collection at sea, so you’re sure to find the perfect accompaniment to your meal. 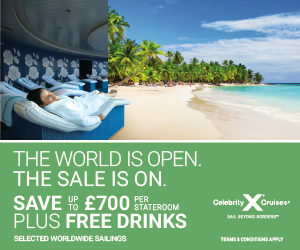 Wine lovers will relish the opportunity to take advantage of the Celebrity Cruises Taste of the Vineyards wine package. With the largest wine collection at sea, Celebrity Cruises store their selection in their iconic Wine Tower – a true treat for wine connoisseurs. The Taste of the Vineyards package is available in most venues throughout the ships, allowing you to savour your favourite label or test your palette with some New World wines. With the help of the onboard sommelier, you’re sure to find some new flavours to cherish. Travelling to 286 destinations across 7 continents, Celebrity Cruises pride themselves on offering their guests some of the most desirable itineraries to satisfy even the most extreme cases of wanderlust. Coupled with their once-in- a-lifetime selection of shore excursions, you’re sure to have a voyage packed with memories to last a lifetime. So whether you’ve always dreamed about floating above the sun-soaked Tuscan countryside in a glorious hot air balloon or accelerating along the switchbacks of the French Riviera in a thrilling red Ferrari, Celebrity Cruises have a bucket-list full of exciting excursions that will leave you awe-struck for days. The unique design concepts that inspired Celebrity Edge will be rolled-out across the whole award-winnning fleet by 2023. The Revoltuion will include brand new Suite Class sanctuaries and spectacular redesigned staterooms. The hottest designer names will be responsible for upgrading resturants, casinos, spas and boutiques. This reimagination of every Celebrity ship will cost in excess of $500 million! The Celebrity Cruises entertainment programme is refined and glamorous. There are decadent theatre shows, sophisticated lawn parties and even cirque-style performances delivered by Poet Theatricals who have an exclusive arrangement with Celebrity Cruises. The live music programme on Celebrity Cruises is also something to marvel at; there are lively jazz bands, elegant string quartets, A Capella singers and guitarists who deliver Concerts on the Green. When you’re not busy dancing the night away to these talented musicians, you’re being thrilled by a series of comedians, jugglers, magicians and more. There’s no other cruise line quite like Celebrity Cruises - they’ve mastered contemporary luxury at sea. Combining elegant guest experiences with innovative touches of technology they’ve created an ambience that’s rather unique. The opulent decor, incredible culinary experiences, enchanting entertainment and choice of destinations and land excursions is something to marvel at – it’s the ultimate cruise experience. With so much luxury to lose yourself in onboard, you’d be forgiven for thinking this might bring with it those pretentious types – but you’d be wrong. Celebrity Cruises are for those who seek fun, enrichment and incredible experiences that become memories to last a lifetime. Celebrity Cruises in the only major cruise line in the world that’s able to offer trips to the unspoilt and utterly incredible Galapagos Islands. With over 1,900 species calling the islands home, this cruise destination is a must for nature lovers. You’ll voyage to the Galapagos Islands on the Celebrity Xpedition which is a cruise ship like any other. Offering guests half luxury cruise and half intrepid exploration, the Celebrity Xpedition is a smaller cruise ship, capable of reaching smaller and less-travelled ports around the world. Not only will your journey to the Galapagos be unique, but your experiences there will be something quite spectacular too as shore excursions include snorkelling from Black Beach, travelling to Cormorant Point to see the rare Floreana Mockingbird as well as sharks, spotted Eagle Ray and sea turtles or even visiting the Charles Darwin Research Station on Puerto Ayora. This is the ultimate once-in- a-lifetime voyage and Celebrity Cruises offer you the opportunity to make the most of this unbelievable journey.